Where Do You Get Your Lumber From? Many people question Tom if he harvests his own lumber, he would like to but he does not have the time or equipment, being a one man shop he focuses on design and making. So he purchases hand selected lumber through mainly five resources. He has been working with these dealers over the past twenty-five years and they know what types of woods that he is looking for; Black Earth Wood Products, Friendship Hardwoods, Hardwood Enterprises, Kettle Moraine Hardwoods and Preferred Hardwoods. 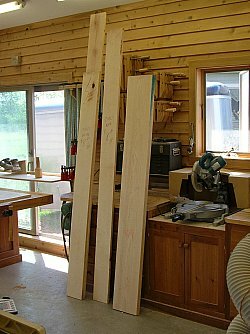 As for the types of lumber Tom purchases, it is both softwoods and hardwoods. Softwoods are not weaker than hardwoods. Softwoods come from coniferous trees such as cedar, which he uses aromatic cedar for his drawer bottoms. It’s relatively easy to find sustainably grown softwoods. Tom loves to work with hardwoods. The variety of colors, textures, and grain patterns makes for some beautiful and interesting-looking furniture. The downside to hardwoods is their price. Some of the more exotic species can be too expensive to use for anything more than an accent. Some hardwoods are becoming very hard to find and are being harvested without concern to their eventual extinction. Not only is this hard on the environment, it drives the price of the wood so high that making furniture out of it is out of the question. Cherry is a very popular and all-around great wood; easy to work with, stains and finishes well with just oil, and ages beautifully. Cherry's heartwood has a reddish-brown color to it and the sapwood is almost white. Cherry has a hardness of 2 on a scale of 1 to 5. This is a very common wood for furniture-making and is available from sustainably grown forests. Because it's in demand, cherry is getting somewhat expensive compared to other domestic hardwoods, such as oak and maple. Cherry wood is one of Tom’s favorite woods to work with.